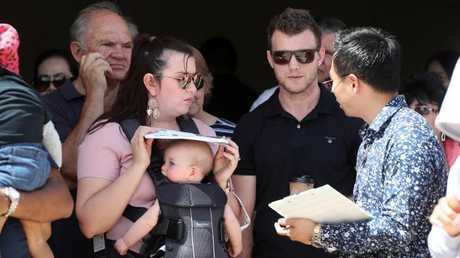 Jeff Horn was a registered bidder at a Sunnybank Hills auction on Sunday, holding his nine-month-old daughter Isabelle. Picture: Tara Croser. 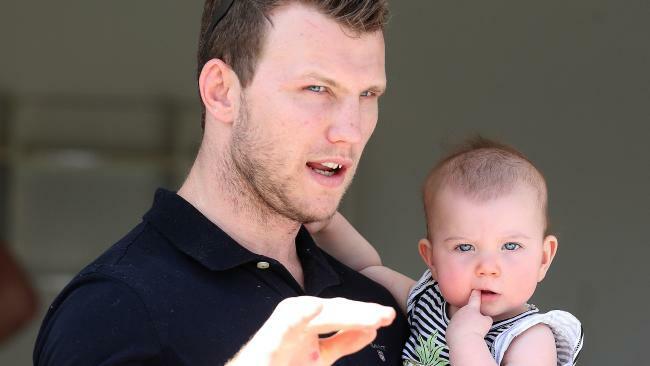 FORMER world boxing champion Jeff Horn has thrown his hat into a new ring in his bid to find a multimillion-dollar home for his young family. 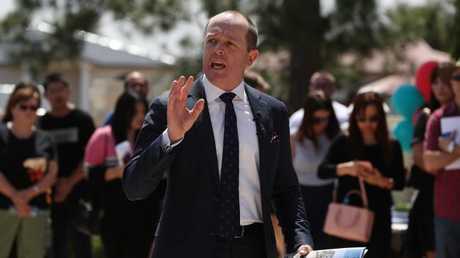 Bidders at one of the biggest auctions Brisbane has seen so far this year found themselves rubbing shoulders with the world sporting star on Sunday as hundreds turned out to see 82 The Avenue, Sunnybank Hills, go under the hammer. 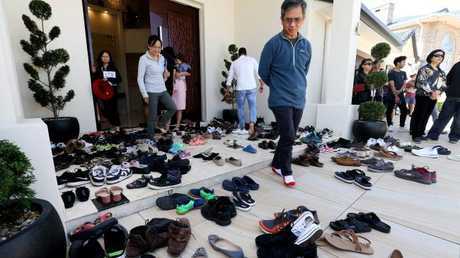 Mr Horn told The Courier-Mail before the auction that they were keen and had inspected the five bedroom, five bathroom, eight car space home several times. "It's very nice, a lovely home if we are able to get it," he said. "It's a nice area - nice and quiet. It's very lovely going into the neighbourhood." 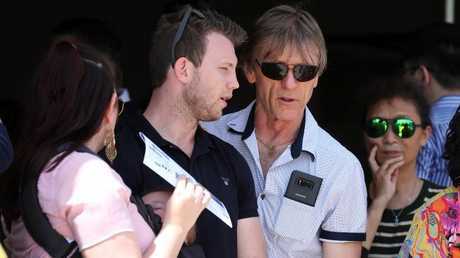 Mr Horn, his wife Joanna and nine-month-old baby Isabelle Kate turned up to the action along with his trainer Glenn Rushton. Yong agent Tom Zhang speaking with registered bidders Jeff and Joanna Horn at 82 The Avenue in Sunnybank Hills. Picture: Tara Croser. "There's a heap of people here, it's crazy," Horn said of the crowd turnout. "I don't think all of them are going to be bidding but are here to have a look. We met a couple of the neighbours"
Mr Rushton said "that's what happens quite often" that is, "everyone in the street where there is an auction come out". 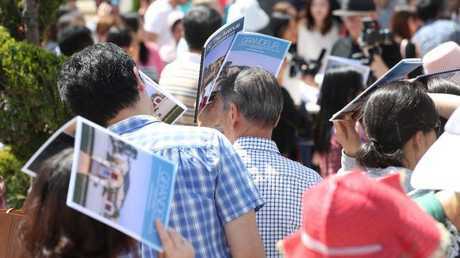 Huge turnout at the Sunday auction of 82 The Avenue in Sunnybank Hills. Picture: Tara Croser. The home's features which wowed the Horns included a fully equipped gym, a 5kw European solar system, full automation for gates, security, lights, airconditioning with touchscreen wall panels, a resort style pool and guest poolhouse and a professional quality cinema perfect for catching the next game on the big screen. Place agent Kevin Chiu speaking with Jeff Horn's trainer Glenn Rushton during the auction. Picture: Tara Croser. Bidding kicked off at $2.5m, with Mr Horn remaining calm throughout what ended up being an hour long process as negotiations went back and forth between multiple bidders. Mr Horn, whose bidding card was number 11, may have earned $5m last financial year for his world title bouts, but when bidding stalled just over $3m on this house, he decided to throw in the towel. Asked if he was going to keep looking, he said "oh yes definitely". 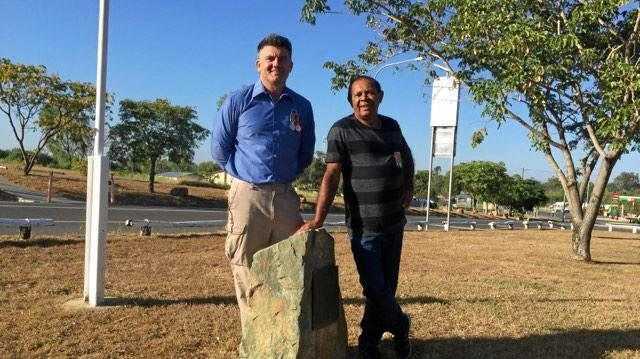 While he loves the Sunnybank Hills area, don't be surprised if he rocks up at a southside auction near you, with Mr Horn telling The Courier-Mail he was keen to find a home "just anywhere around here". Registered bidders Jeff and Joanna Horn with daughter Isabelle and trainer Glenn Rushton after bidding stalled at 82 The Avenue in Sunnybank Hills. Picture: Tara Croser. 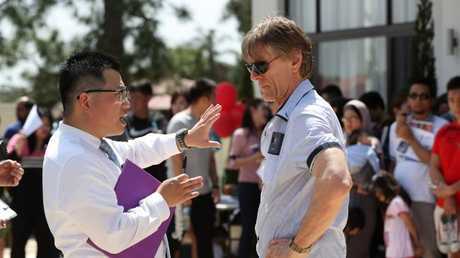 Real estate agents Tom Zhang of Yong and Kevin Chiu of Place have several negotiations underway with interested parties, but would not discuss who they were. 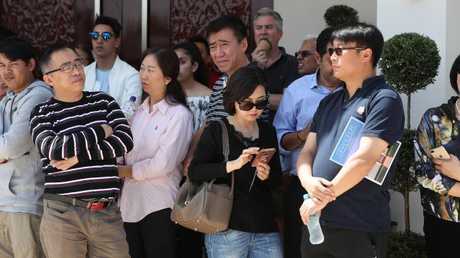 "This is one that drew the most people during inspections," Mr Zhang said. "Over 200 groups came through over five weeks, and it exploded with views on realestate.com.au with over 11,000 views for the video. Today over 10 registered parties attended the auction." 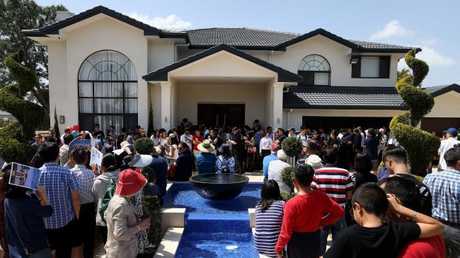 The auction was said to be one of the biggest the agents had seen in the area. Picture: Tara Croser. Mr Chiu said the area had not seen anything like it. "This is the most crowd we have ever seen in our career to be honest. Today we have a couple of hundred people here." "We now have private negotiations with registered bidders. They want to go and discuss with their family first. We're very confident something will come out." Auctioneer Phill Broom was kept busy. Picture: Tara Croser. Homeowner Rubinder Singh was "very nervous" earlier looking at the large crowd that turned out. "We didn't expect this much but I think we got good exposure. You can't even find a park on the street and it's a big street. People are parking on the grass." The house was formally passed in at $3.35m, with negotiations ongoing. The home opened for a half-hour inspection before the auction. Picture: Tara Croser. Sunnybank Hills is classed by realestate.com.au as a high demand market, with the median house price above the Greater Brisbane median at $676,500. One in five homes are older couples and families in the area. The home drew a variety of high bidding families. Picture: Tara Croser.